On Tuesday, Kathleen McClaskey of Personalize Learning shared the compelling story behind her passion for discovering the learner in every child. Today she’s back to give you practical tips on using the UDL lens of Access, Engage, and Express to help each learner reach his or her potential. The floor is yours, Kathleen! For too long, schools have identified who the learner is and how they learn using learning styles. Some learners are labeled based on their disability. In today’s post, we ask you to open a new door and consider using the neurosciences to discover the learner in every child. How do you understand how a learner learns best? Universal Design for Learning (UDL) is a research-based set of principles developed by CAST (Center for Applied Special Technology) in the 1990s to help guide the design of instruction and learning environments. The idea behind UDL is to reduce the barriers to learning and optimize the levels of support and challenges to meet the needs and interests of all learners in the classroom. UDL is grounded in neuroscience and provides an understanding about the what, how, and why of learning. It tells us that there is variability in how each learner learns: their strengths, challenges, aptitudes, talents, and aspirations. UDL is a framework that applies to ALL learners as a means for creating personalized, learner-centered environments where each student can develop agency. The most important thing for teachers to understand is how learners can best access and engage with the content and express what they know. With this understanding, teachers will be better equipped to design the best instruction. At Personalize Learning, we were approached by teachers and administrators to develop a clearer and more practical way of applying the UDL principles in daily practice. We decided on three terms–Access, Engage, and Express–to provide the lens for understanding how every learner learns best. Each learner has variability in how they access and process information, how they engage with content, and how they express what they know and understand. Using the UDL lens of Access, Engage, and Express to understand learners can not only help the teacher better design effective instruction, but can also offer the learner a way to tell their story about how they learn best. When the learner uses the UDL lens to share how they learn, it validates them. If all schools adopted this UDL lens, it would have a positive and profound impact for all learners in a personalized learning environment. So let’s take look at how you can discover the learner in every child. It’s a common practice to use labels to describe many learners and our developing perceptions of who they are or could be. 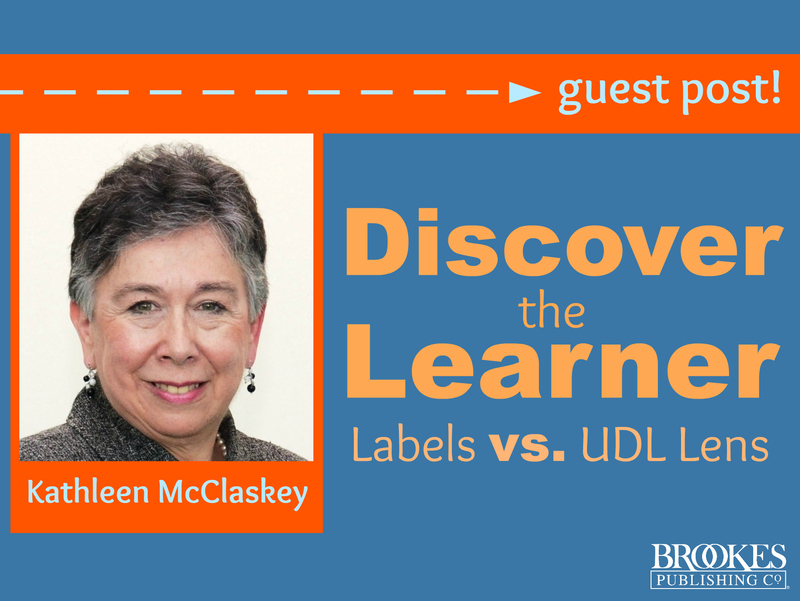 The question is, Would you want to use labels or a lens to discover the learner? 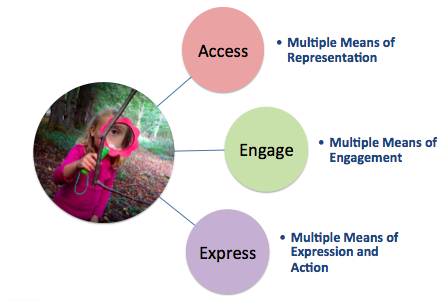 Before I begin, think of a child in your classroom who has been identified with labels like “learning disabilities,” and “speech and language impaired,” and then think about how you could use the UDL lens of Access, Engage, and Express to understand who they are as a learner. Now let’s look a real-life example of a learner who was described with labels and examine his outcomes. I’ll use the example of my own son. We’ll look at him before first grade and after first grade and consider his outcomes, and then we’ll use the UDL lens of Access, Engage, and Express to develop a Learner Profile and discover who he really was as a learner. Finally, we’ll look at a Personal Learning Backpack that includes the types of tools and skills he could have developed to become an independent learner. Before first grade, my son was curious, creative, and imaginative. These are qualities we love about young learners. He was a storyteller with a great vocabulary and excellent memory skills. He tripped me up a few times with his ability to remember details. He was math smart and could calculate multi-digit numbers mentally at 5 years old. Above all, he had a love for learning and exploring. Let’s take a look at who he was after first grade. By the time he was 8 years old, he was tested and labeled with learning disabilities, reading disabilities, attention deficit disorder, and writing deficits. More labels were added as he became an adolescent. My son’s outcomes were not good, like so many learners that we know with this type of learning profile. He did not realize his hopes and dreams, nor was he ever able to follow his passions to find his purpose. Think about the learners in your classroom and in your life. What are their strengths and challenges in how they Access, Engage, and Express? What are their interests, talents and aspirations? To support his challenges with Access, my son could have used Voice Dream to access books, classroom handouts, and activities. He also could have used Notability to draw and to record his notes and ideas. He would need direct instruction to support his decoding and reading comprehension, but with these tools in his Personal Learning Backpack, he could have been more independent in accessing daily materials that require reading. For my son’s Engage challenges, he could have used a file and folder management system to organize information and Remind for planning his time. For Express challenges, he could have used Popplet for organizing ideas and a word prediction tool for writing. To expand on his strengths under Express, he could have used Explain Everything, iMovie, or Prezi to express his ideas and his learning. He could have developed skills and strategies around these tools to become independent and self-directed in his learning. These are just some of the tools and strategies that could have been used to support my son. What tools, skills, and strategies would best support the learners in your classroom? Using the UDL lens to discover the learner can be a great conversation starter between teacher and learner. In this conversation, the student can share their Learner Profile that indicates how they Access, Engage, and Express and includes their strengths, challenges, preferences, and needs. They can share who they are, what they are interested in or passionate about, and what they aspire to be. As the partnership between teacher and learner evolves, the two can collaborate on the design of a Personal Learning Backpack. Then they can work together to set learning goals and record them on a Personal Learning Plan so the learner can gain the skills they need to become more independent. With these goals set down on paper, the learner can begin to monitor their own progress and modify and set new learning goals based on the Learner Profile. When new goals are set, teacher and learner can discuss, define, and plan skills and learning strategies together. During this process, the learner gains new skills and strategies as challenges turn into strengths and the partnership with the teacher grows stronger. When this happens, the student is truly on the path to becoming a self-directed learner with agency. 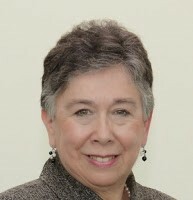 Kathleen McClaskey is co-founder of Personalize Learning, LLC with Barbara Bray. She is also the co-author of two books with Barbara: the bestseller Make Learning Personal and an upcoming book this fall, How to Personalize Learning: A Practical Guide for Getting Started and Going Deeper. She is an international presenter and professional developer on Universal Design for Learning and Personalized Learning. Connect with Kathleen on Twitter or send her an email here. Universal Design for Learning is a registered trademark of CAST, Inc. Access, Engage, and Express, Learner Profile (LP), Personal Learning Backpack (PLB) and Personal Learning Plan (PLP) are trademarks of Personalize Learning, LLC. Your work is inspiring & amazing. I would like to not only buy your new book ‘How to Personalize Learning’, but also invite you on Board of Akara Education, a new initiative founded by my team in India, that helps schools transform by adopting student-centred, personaized learning models. I would also like to meet with you to take forward the proposal for aiur academic partnership.